Mention DC Thomson's Starblazer to some and you will either get a look of nostalgia, or, from others, perhaps a slight look of confusion. From 1979 to 1991, through 281 issues, this anthology title took its readers to new galaxies, to read about the adventures of Space Police, Mad Scientists and Evil Robot Geniuses. Characters such as Mikal R Kayn, Cinnibar of The Star Corps, and The Suicide Squad thrilled countless readers with their episodic adventures. Starblazer Adventures, as well as being inspired by the DC Thomson title, also includes a section on its history of the comic, which if you’ve never heard of it -- and I'll confess, I had the title confused with memories of New Eagle - helps a lot. Now all you are need is a minimum of three players, some six sided dice and your own imagination, plus of course this book! 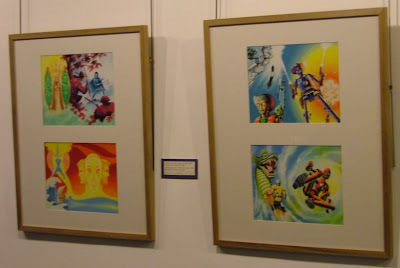 The publication of Starblazer Adventures is apt, with 2009 marking the 30th Anniversary of the release of the first issue (also marked by an exhibition of artwork at the University of Dundee). At 600 plus pages long this is certainly a large book but it is packed with sufficient information to make up at least one core rule book and two sourcebooks. Chapters enable you to design your own universe, including spaceships, weapons and alien civilizations, even planets and galaxies, which can all be found within. Its glossy, bright and slightly retro hardback cover enhance its nostalgic appeal. Using the recently-released Fate 3.0 system the rules require that players design their characters using aspects, which are the personal qualities they believe their character would possess. These include Skills, which include piloting, repair and firing laser weapons at giant Space Bats; Stunts, which grant a temporary bonus to skills but may cost Fate points. (If any of this all sounds a little confusing, don’t worry, as there are examples throughout the book for Gamesmasters, or Story Teller, to use). If you're a regular roleplayer but have never used the Fate system before it can seem a bit daunting at first, but stick with it -- it makes for some strong roleplaying once your character is up and blasting! The book is well designed and uses a lot of artwork from the comic to help set the scene. There are also stats for some of the characters that I mentioned earlier, so if you have ever wanted to be a member of the Star Corps and fight alongside your favourite character, now is your chance. As well as the book, the game's website - www.cubicle-7.com/starblazer.htm - has forums to help if you have any queries, and answer any rule discrepancies (and there are bound to be some!) that you might notice can be sorted out there. In addition, there are downloadable character sheets and reference guides for organizations, ships and any extra characters you may need. Personally speaking, this would be a great game to run with a group of like minded friends. However to get the most out of this game requires dedication as there is a lot of information contained within. In conclusion, Starblazer Adventures is a fantastic game and the retail price of £34.99 offers great value of money. If you're a fan of Starblazer or simply and SF RPG fan, give this a go: we don't think you will be disappointed. • The Starblazer Adventures game is on sale now in the UK and available from the Cubicle 7 online store: and is also on sale now in the US. • Dundee-based artist Trevor Gordon has been in touch, to let you us of a collaborative art project going ahead in Dundee at the Mills Observatory. "I am working with archival material from DC Thomsons and creating sculptural pieces influenced by the work," he reveals. "There will a number of original Starblazer works on display and a number of strange sculptural pieces in a range of mediums. • Jeremy Briggs has completed a series of Moon Landing Anniversary posts for downthetubes, which will be published daily starting on Wednesday (15th July). The posts feature art and comics work published during or after the first Moon Landing. Meanwhile, our Comics Celebration of the 40th Anniversary gathers pace, with our album of art now featuring work by Adam Grose, Martin Baines, Ian Duerden and others. The album can be embedded on any web site to help celebrate this major endeavour of human exploration. Further art - illustration, strip, cartoons is welcome: If you don't want to join our forum and upload art but would like to join in with the celebrations, simply send your work to johnfreeman6-moonlandinganniversaryart@yahoo.co.uk. Please ensure images are no larger than 2MB in size. • The British Film Institute's "One Giant Leap" season in London continues this coming week with screenings of the films 2001: A Space Odyssey, Countdown and Moonwalk One, the premiere of newly remastered Director's Cut in high definition of Theo Kamecke's film, commissioned by NASA to cover their historic Apollo 11 moonshot. With an atmospheric original score by Charles Morrow and a moody narration by Laurence Luckinbill, Kamecke's documentary has been described as perhaps the most significant time-capsule record of Apollo 11 ever made. • Our thanks to comic creator Emma Vieceli, who kindly gave downthtubes a positive plug on her blog (despite Jeremy Briggs saying that she looked like a Manga character...) - view her comments here. Emma was recently interviewed for BBC Blast, revealing How To Get Creative! • Graeme Neil Reid has announced he will be joining a huge number of comic creators at the Thought Bubble in Leeds at the end of November, so if you are thinking of going to any comic cons this year that would be one to consider. • Talking of events, Insomnia Publications will be part of the line up at the Oxfam Comics Fest on 18th July at Macdonald Road, Edinburgh from 12 noon to 3.00pm. We've given this a plug recently, but Oxfam has been in touch with an update, reporting there will be discussion panels on Comics In Scotland and The Ups And Downs Of Small Press Publishing, featuring writers Ferg Handley (Marvel Heroes, Commando) and David Bishop (2000AD, Doctor Who) and other guests. "We'll be holding a silent auction of some great comic book related merchandise, including a piece of original artwork from Spectacular Spider-Man," reveals organiser James McConnell, "signed by the artist, presented with a page of the script, signed by the writer, and other excellent items. "There will also be an exclusive sneak peek at some never before seen pages from the upcoming Burke & Hare graphic novel from Insomnia Publications, and a stall selling comics and graphic novels." •Tickets are £3.00 at all Oxfam Bookshops in Edinburgh, on sale now! Stars of ITV's co-produced mini-series The Prisoner, including Jim Caviezel, Jamie Campbell-Bower and Lennie James will be at the upcoming Comic Con 2009 in San Diego at the end of this month, for a panel event and exclusive sneak preview of the highly anticipated six-part series inspired by the cult 1960s show that starred Patrick McGoohan. Giveaways at the special event, organised by US co-producer AMC, will include a free Marvel Comics-produced tie-in comic and more. The Prisoner panel, scheduled for Friday, 24th July at 1130am at the San Diego event, also features The Prisoner writer Bill Gallagher (Conviction, Clocking Off) and AMC’s Vlad Wolynetz, vice president of production, and will be moderated by producer and director Robert Meyer Burnett. The Prisoner, described as a "re-imagination" of the 1960s cult classic created by the late Patrick McGoohan, premieres this November on AMC in the US, and, presumably, at the same time on ITV. AMC co-produced The Prisoner with Granada and ITV and Granada International will distribute the series worldwide, which was directed by Nick Hurran (It’s a Boy Girl Thing, Little Black Book). During the hour-long Comic Con event, Burnett will lead panelists in a discussion about their personal experience making The Prisoner, shooting the series in Namibia and South Africa, and the various themes explored in the re-imagination, among other topics, followed by an exclusive first look at the mini-series, and a Q&A session with attendees. • Attendees will have an opportunity to obtain their own Village identity by visiting The Prisoner booth to pick-up an official Village ID badge, on which they will be identified by number only. As with the original show, The Prisoner tells the story of a man, “Six” (Caviezel), who wakes up to find himself inexplicably trapped in a mysterious and surreal place, The Village, with no memory of how he arrived. As he frantically explores his new environment, he discovers that Village residents are identified by number, have no memory of any prior existence, and are under constant surveillance. The Village is controlled by one man - the sinister and charismatic “Two” (Sir Ian McKellen). Throughout the series, “Six” and “Two” are locked in a battle of wits, as “Six” challenges the oppressive nature of The Village and struggles to learn the truth behind it. The Prisoner is AMC’s second original mini-series and combines a wide range of genres, including espionage, thriller and sci-fi, into a unique and compelling drama. The six part mini-series will reflect the same key elements of paranoia, surveillance, liberty, and socio-political commentary seen in McGoohan’s enigmatic original. Top Brit podcast site Geek Syndicate have launched a new podcast on under our banner dedicated to all things 2000AD - possibly the first of its kind devoted solely to Rebellion's weekly scifi comic. go right back to the beginnings with a retrospective look at one of the magazines formative editions. Along the way they also go into the latest 2000AD trades they have added to their collections as well as associated games, movies and anything else vaguely related to the mag. With more of a "Listening to two mates talking in the pub" feel than a professional radio one, expect tangents, language not suitable for the kiddies and general confusion as they look back on the comics of their childhood and compare them to the latest output from the offices of Tharg the Mighty. 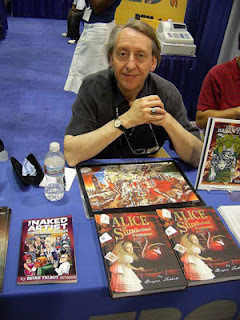 (with thanks to Pádraig Ó Méalóid): Congratulations to top comics creator Bryan Talbot, who has been awarded an honorary doctorate for his “outstanding contribution to the Arts as writer and graphic artist” by Sunderland University. The ceremony is on Friday 17th July at the annual Sunderland University award ceremony at The Stadium of Light, Sunderland. As Padraig commented: "What with this and Terry Pratchett's knighthood, it seems that geekery is taking over the world. Go us!" "It's fantastic news and well deserved," say Leah Moore and John Reppion. "I can't wait for the first time he says 'Stand aside, I'm a doctor!' (he definitely will)." (Updated 14 July 2009): Media trade magazine Broadcast is reporting that the company Chorion has secured international licensing rights for "classic" Dan Dare, as featured in the original Eagle comic, offering the character for "a broad range of licensing applications." All merchandising will be handled by the Copyrights Group Limited, a Chorion company. However, book rights for Dan Dare - and also for all the Eagle properties owned by Dan Dare Corporation - are handled by Gordon Wise at the British literary and talent agency, Curtis Brown Group Ltd. Among its many properties, Chorion controls the rights to the estates of authors such as Agatha Christie, Raymond Chandler and Dennis Wheatley. Its portfolio includes Noddy, the Mr. Men, Paddington and The Wombles. They also hold rights to the Ladybird Archive and more. "Chorion will work to boost the popularity of the classic character through licensing deals," Broadcast reports. "Agreements have already been secured with Simon Spicer for greeting cards and wrap, Somerbond for apparel, Day 2 Day Trading for figurines, and Russimco, who will be launching a master toy range in early 2010." "The unique heritage artwork of Dan Dare created by Frank Hampson and a team of young highly talented artists is simply breathtaking in quality, with vivid colours and precise detail," say Chorion.Chorion's Dan Dare web page, which is now live (no direct link) is careful to promote the original Dan Dare and the work of Frank Hampson in his creation. With over 100 years' experience, Curtis Brown, which is handling Dan Dare book rights, is one of Europe's oldest and largest independent literary and talent agencies, representing many of the world's most popular and successful authors, screenwriters, directors, actors, playwrights and celebrities, including Brian W. Aldiss, Margaret Atwood, Alan Garner and Ian Rankin. Mr Wise told downthetubes that the new agreement this is only an arrangement for representation of the brand for merchandise, not any transfer of ownership or anything broader. 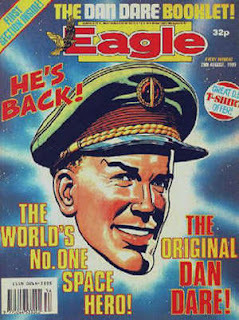 All film and other media rights for Eagle-related properties remain with Dan Dare Corporation, which similarly continues to retain ownership of the Eagle itself and strips also acquired by Dan Dare Corporation/Colin Frewin Associates. • Curtis Brown web site: www.curtisbrown.co.uk. Opened as part of the Dundee Literary Festival Comics Day on Sunday 28 June 2009, Dundee University's Lamb Gallery is currently displaying a selection of artwork from DC Thomson's Starblazer digest in an exhibition curated by Matthew Jarron. 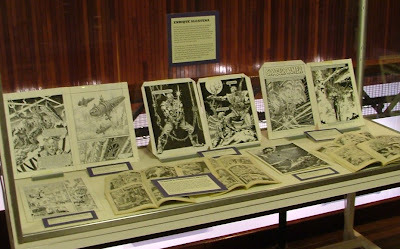 Starblazer was published twice a month from April 1979 to January 1991, running for 281 issues, and this exhibition celebrates the 30th anniversary of the title's launch. Starblazer was the brain child of editor Jack Smith and was run by him and deputy editor Bill McLoughlin before Smith retired and the title was passed over to editor Bill Graham's control. The two eras of the title can be seen in the preponderance of space opera stories during Jack Smith's time and the preponderance of fantasy stories during Bill Graham's. 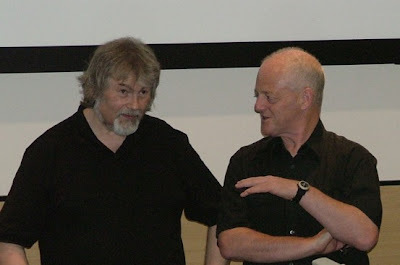 However Bill McLoughlin (shown above with bearded artist Keith Robson) was the mainstay of the title through both editors and it was he who performed the gallery tour during the opening, telling the attentive audience the background to the title as well as offering a few amusing stories along the way. There are more details of the background to Starblazer in the downthetubes interviews with both Bill Graham and Bill McLoughlin. Also in attendance at the opening were Starblazer artists Ian Kennedy (shown above with two of his covers), Keith Robson and Colin MacNeil and the exhibition includes original cover artwork from Kennedy and Robson as well as prints of some of MacNeil's covers. A total of 13 Ian Kennedy covers are on display, from the real world Sphinx at Giza on the cover of Pyramid Power, issue 58, via the humorous science fiction of The Robot Kid, issue 204, to the fantasy of The Triune Warrior, issue 271. Many of the pieces of original Kennedy art on display were reprinted in the 2009 Starblazer Calendar including the spaceship cover of The Lost Planet, issue 33. Speaking during the exhibition's opening, Ian Kennedy voiced the thoughts of many of those around him when he looked at his paintings, owned by DC Thomson, and said that he would like to take some of them home with him. Keith Robson's intricately detailed spaceships take up much of the opposite wall with 9 covers on display while the rather more western themed cover for Galactic Lawman, issue 56, shows his love of the old West. They also give an indication of the breadth of Robson's art style as those of us at last year's Beano exhibition remember his colour Beano artwork hanging on the same wall. Colin MacNeil's covers are represented by prints including an enormous one of the final published cover, The Enchanted Helmet issue 281. In addition the exhibition has a selection of other covers by artists including Mark Gorton, Ron Brown and Alan Burrows as well as a beautifully detailed painting used for the cover of issue 188, The Infernal Triangle, by Jose Casanovas Jr. 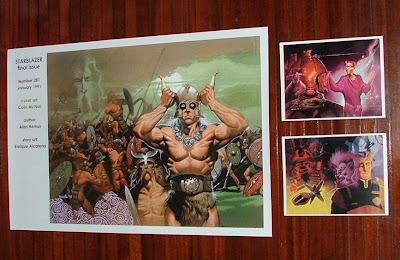 While he may be better known for his black and white interior artwork for Starlord and 2000AD, based on this one painting I would certainly like to see a lot more of his painted art. 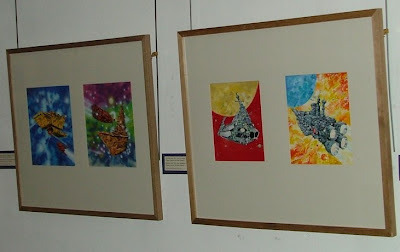 The exhibition cabinets contain many issues of the publication and examples of its black and white interior artwork with a lot of original art from Argentinian artist Enrique Alcatena. There are also several original scripts and production copies of artwork plus the two recent Starblazer spin offs - the Starblazer Adventures role-playing game book from Cubicle 7 and the Starblazer Calendar from Unique Comic Collectables. The Lamb Gallery was where the Beano 70th Anniversary exhibition was held last year. 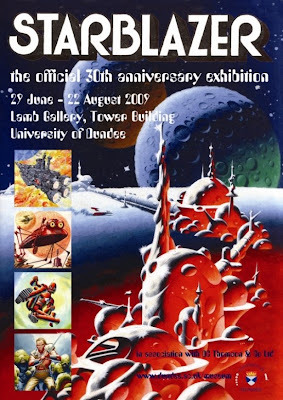 In comparison to the enormous artboards used for the Beano artwork, the smaller size of the Starblazer artwork is not quite as striking on entering the gallery, but the sheer detail on the artboards and the brilliance of their colours even after three decades means that this exhibition is an impressive reminder of a much loved title. The Starblazer exhibition is open Monday to Saturday until 22 August 2009 at the Lamb Gallery in the Dundee University Tower Building which is a short walk from both Dundee's train and bus stations. Entrance is free. There are more details on the Lamb Gallery website. The Forbidden Planet International blog has just published a smashing interview by Pádraig Ó Méalóid with Eddie Campbell (From Hell, Alec and much more), just as Top Shelf’s big Alec: the Years Have Pants collection is announced in Previews, due this autumn in both hard cover and paperback. The interview covers 2009 Eisner Award nominee Eddie's career from his earliest, self published work to DC, Marvel, the First Second work, From Hell and some upcoming work like The Playwright. Top Shelf's Alec: the Years Have Pants is a 640-page compendium which Eddie describes as "undoubtedly my single most important publication to date. "It collects the work that has always been the principal strain of my oeuvre, and it allows me the opportunity to add a new ‘book’ to the set," he reveals. "The thing I enjoyed in seeing it all together was a sense of sweeping through time, of characters ageing, without that being a conscious plan, since after all I drew it all over a course of nearly thirty years." The collection includes work such as 'The King Canute Crowd', 'Graffiti Kitchen', 'How to be an Artist' and the new book, The Years have Pants. There are also a couple of sections of short things and fragmentary works, appearing in their proper sequence. While it's still largely focused on US events, comics fans and British convention organisers might want to check out UpcomingCons.com, a new web site which hopes to list conventions around the world. Offering a new fan convention resource focused on anime, comics, gaming, and sci-fi the site already features over 200 upcoming conventions listed with links to official websites, with the added feature of enabling users to use the website to find convention roommates. Every year, thousands of convention attendees look for people to share rooms with, to help offset the typically high cost of having a room at a convention hotel for three nights. Any fan can register for an account, go to the page of their favorite convention, and sign up to find hotel space, or to offer their hotel space for others. Other users who does the same thing will have a chance to see who else will be going to the same convention. Ryan Kopf, a board member for the fan organization Mindbridge Foundation, a not-for-profit corporation organized to provide a resource group for those interested in Science Fiction, Fantasy, and related area, began working on UpcomingCons.com and developing features last month. His hope is to create a resource that would enhance fandom over multiple genres. "I think convention attendees have always needed a good, reliable place to find upcoming conventions,” said Kopf. “Game, Comic, and Sci-Fi conventions had seemed the most neglected." While there are several sites that list disparate genre events (including downthetubes), this site seems to be out to be a useful one stop shop for fans of comics, manga and film, offering not just event info but photo galleries and reviews, too. The room mate feature could also be useful, assuming certain safeguards are built in to protect users. • Convention fans may also be interested in conventionfans.today.com, a news blog for convention happenings. The big-screen adaptation of the most celebrated graphic novel of all time, Watchmen, will be released as a Region 2 two-disc DVD and Blu-ray with Digital Copy on 27th July. Directed by Zack Snyder (300), the 2-disc DVD of the film, based on the eponymouse award-winning comic by Alan Moore and Dave Gibbons, comes loaded with nearly two hours of special features, including ‘Real Superheroes, Real Vigilantes’, 11 Webisodes, four viral videos and the music video for the My Chemical Romance version of the Bob Dylan song, “Desolation Row”, which was recorded for the film. The Blu-ray version will give audiences a stunning viewing experience, featuring 5.1 Dolby TrueHD and containing all the special features from the 2-disc format. In addition, a Digital Copy of the film is included to be easily transferred to a computer, Video iPod, iPhone and other portable media players. A complex and multi-layered mystery adventure, Watchmen is set in an alternate 1985 America; a world darkened by fear and paranoia in which costumed superheroes are part of the fabric of everyday society, and the Doomsday Clock – which charts the USA’s tension with the Soviet Union – moves closer to nuclear midnight. When a former colleague, The Comedian (played by Jeffrey Dean Morgan – TVs Grey’s Anatomy) is murdered, the outlawed but no less determined masked vigilante Rorschach (Jackie Earle Haley – Semi-Pro) sets out to uncover a plot to kill and discredit all past and present superheroes. As Rorschach reconnects with his former crime-fighting legion, a disbanded group of retired superheroes, including Nite Owl II (Patrick Wilson – Lakeview Terrace), Silk Spectre II (Malin Akerman – The Heartbreak Kid), Ozymandias (Matthew Goode – Brideshead Revisited) and Dr. Manhattan (Billy Crudup – Mission: Impossible III), the only one who has true powers – he glimpses a disturbing conspiracy with links to their shared past and catastrophic consequences for the future. Together, the heroes must expose a sinister plan that puts the human race and their own existence in grave danger. Their mission is to watch over humanity... but who is watching the Watchmen? • Those pesky Scottish creators are attempting another coup of downthetubes with a reminder that Scotch Corner, a collection of Scottish artists, is up and running. The fine team from north of the border include Thomas Crielly, Gary Erskine, Andy Hepworth, Jon Hodgson and Graeme Neil Reid. "Every day there will be a new piece of art posted, each artist posting on a certain day," says Thomas" We kicked off last Wednesday so have a look and feel free to comment on the images." The blog will also feature the work of guest artists: on Sunday, Leigh Gallagher kindly provided this splendid 2000AD-inspired image. • A quick reminder that the London Film and Comic Con takes place later this month (Saturday 18th and Sunday 19th July) at Earl's Court 2. As well as media guests such as Scott Bakula (Quantum Leap, Star Trek: Enterprise), Tom Baker (Doctor Who), Bruce Boxleitner (Babylon 5, Heroes) and Eve Myles (Torchwood), comics creators such as Spider-Man artist Lee Townsend, The Beano's Henry Davies, Doctor Who Magazine's Mike Collins, John Charles and Al Davison are also on the guest list, as well as publishers such as Orang Utan Comics. More info via www.londonfilmandcomiccon.com/. • Brilliant British cartoonists news site Bloghorn - for some reason, often a breed apart from comics artists, although I'm never sure why or how that happened - reports the Chris Beetles Gallery in London will stage A Celebration of Cricket: From Ashes to Zooter from 15th July 15 until 8th August. Encompassing 200 years of cricket and featuring illustrations and watercolours, more than half the show will be devoted to cartoons, including the work of Glen Baxter, Mark Boxer, Tony Husband, Jak, John Jensen, Larry, Nick Newman and many more. 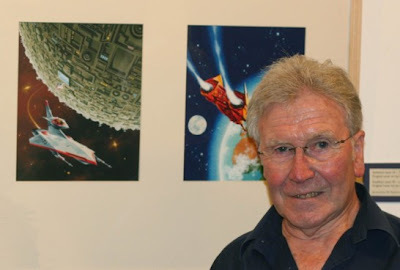 • 2000AD and Star Wars artist Colin Wilson reports he's got his own web site. "After 14 years of maintaining a website, I've finally got myself a domain name. With my old ISP cutting me off a lot quicker than expected, thanks to Wolfgang at Gestalt my comic work, in all its glory, can now be found here (http://web.mac.com/wilco440). Who knows, I might even have the time to update the site one day...."
• Over on the Forbidden Planet International blog, Richard Bruton has given a glowing review to the latest issues of indie detective comic treat Harker, the work of York-basd publishers Ariel Press, which we had no hesitation in plugging earlier in the year. "Harker issue 1 & 2 were reviewed a few weeks back. The verdict: I thought it was great," he opens. "So with issues 3 & 4 I was really hoping it was going to live up to the promise of the first issues. Well, [Roger] Gibson & [Vince] Danks have taken that promise and really gone for it. If 1 & 2 established the characters and setting and dastardly plot, then 3 & 4 are where they relax and open out into the story some more. It’s still completely fantastic genre stuff but it just gets better and better and better here." Comics artist Lew Stringer picks up on news that broke over at web site Comics UK that Euan Kerr, DC Thomson's Deputy Manager of Children's Publishing and former long-standing editor of The Beano and other titles, is to retire. Dismissing wild rumours that he had been sacked (but making no comment about that DC Thomson is engaged in a serious 'rationalisation' of its workforce at the hands of consultation company Pricewaterhouse Coopers, which include offers of voluntary redundancy), Euan told comics fans that while he was tempted to make up an exciting and intriguing reason for his departure, "I'm going by my own choice and didn't negotiate any special deal. "After 40 years in the business and with my health and sanity almost intact, the lure of the golf course was too much!," Euan, who edited The Beano for 22 years before handing over to his Chief sub-editor Alan Digby in 2006 explained. "I've loved my time in comics and hope to do some part-time writing," he added. As editor of The Beano, Euan was intstrumental in keeping The Beano at the top of the UK comic sales chart for years, often appearing on TV to promote it. His credits also include The Crunch, where he worked as 'agony uncle' Andy (pictured above), as revealed in our Bill Graham interview last year. He's always said he enjoyed his time on The Beano, and leaving the hot seat on the title back in 2006 was a wrench. "I was left a wonderful legacy of great comic characters by my two predecessors in the Beano hot seat, George Moonie and Harry Cramond," he revealed in an interview for the Forbidden Planet International blog back in 2006. "Over the years I tried to introduce new characters to topple Dennis the Menace from the top of the readers’ popularity polls. "I’d have to admit that I didn’t even come close to achieving that aim," he admits. "I’d put this down to Dennis’s striking design and simple philosophy on life to pack in as much fun as he possibly can during waking hours. This allows the writers to unleash him into contemporary situations. I’ve often been quoted as saying that Dennis was the original Punk." Alan Digby moves up to become what Euan describes as "Commander in Chief" of both The Beano and BeanoMAX, the monthly comic/magazine hybrid Euan launched in February 2007 as an 'older brother' to The Beano. "Euan did a fine job both as an editor and as the media 'face' of The Beano for decades," notes Lew Stringer on ComicsUK. "The task of an editor can be a subtle one, as far as the readers are aware. We immediately notice art changes for example but the editorial guidance to a comic is often under the radar. "It's fascinating to see how editors put their own stamp on a comic and Euan guided The Beano through some difficult periods in comic history when lesser titles fell by the wayside." Here at downthetubes, we wish Euan all the best on his retirement and every success in his endeavours beyond DC Thomson's Dundee HQ. These include an already sold out-event at for the Edinburgh International Book Festival in August where he'll be joining former Beano writer Morris Heggie and artist Jim Petrie in "bringing The Beano to life as you've never witnessed before." The event will involve the audience in inventing a new Beano-inspired character and watching it develop. Apollo 11: Behind the Scenes? Contributions to our 40th Anniversary of the Moon Landing Comics Celebration album on the downthetubes forum are coming in daily, with this latest gem from comics, storyboard artist and illustrator Martin Baines, a tongue-in-cheek tip of the hat to the film Capricorn One, which capitalised on deeply ingrained claims that the moon landings never happened by positing a faked landing on Mars, all shot in a remote film studio. Martin's credits include work for Match of the Day Magazine, Spaceship Away and many other magazines: he's represented by Smudged Pencil. Here at downthetubes we're unconvinced by sceptics - given voice recently by character Tyrone Dobbs in Coronation Street, of all places - that the moon landings never happened, but Martin's art gave us a laugh. Other contributors so far include Bugpowder contributor Dan Fish with a strip called "The Moon's A Balloon", the Etherington Brothers, Mike Nicoll, Malcolm Kirk, Doctor Who illustrator Colin Howard, games artist Gary Hall and Bob Bello. More contributions from comics artists and illustrators to help mark this major anniversary for space exploration are very welcome: we see it as an opportunity to present a portfolio of themed work based on space and space exploration (real or imagined) that should generate press interest given the upcoming anniversary. The album can be “embedded” on any web site. If there’s a strong response to this, we may also do a MyEbook version. Text pieces are also welcomed: we're not quite sure how to present those yet, perhaps in another part of the downthetubes forum. We don’t want writers to be left out. If you don't want to join our forum and upload art but would like to join in with the celebrations, simply send your work to johnfreeman6-moonlandinganniversaryart@yahoo.co.uk. Please ensure images are no larger than 2MB in size. 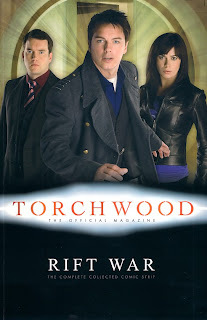 When Titan Magazines launched Torchwood The Official Magazine in January 2008, they chose to follow the example of Panini's Doctor Who Magazine and include a comic strip. 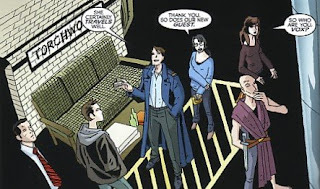 While the Doctor Who comic strip is an historical remnant of Doctor Who Magazine's beginnings as the Doctor Who Weekly comic, a comic strip in the magazine of the more adult orientated Torchwood was seen as a brave move on editor Simon Hugo's part. It did raise a few eyebrows when in the first issue's comic strip The Legacy Of Torchwood One artist SL Gallant drew the story's main guest star as actor and comedian Bill Bailey while the lack of a comic strip in issue 2 left readers wondering just what was going on. However it was back in issue 3 while issue 4 began the ten part Rift War story arc. Titan's Rift War graphic novel is the first compilation of that comic strip and features the ten part story of the same title plus Jetsam, the Brian Williamson written and illustrated story from issue 3 concerning gigantic alien motorcycles. Despite the photographic front cover only featuring the season three cast, the stories are set before the deaths of Owen and Toshiko in season two. Cardiff is attacked by the Harrowkind alien warriors who came through the Rift and as the Torchwood operatives battle them they soon realise that it is a diversionary tactic to steal the Rift Manipulator from the Hub. Tosh recovers the manipulator with the help of the alien Vox who remains at Torchwood as he is on the run from the Harrowkind's masters, the Sanctified. After a few less violent Rift disturbances the Sanctified attack once again and Torchwood have to decide if their enemy's enemy can really be called their friend. While the ten episodes are all called Rift War this is more of a story arc than one subdivided story with some of the episodes in the middle having little to do with the main plot. Of the different episodes the odd Funhouse, in which a giant alien baby is cared for by Gwen and Rhys, sits most uncomfortably amongst the rest while Dino Crisis, as fun as it is, would have made a better Primeval story that a Torchwood one. However the stories are at their best when in full Rift War mode with each eleven page monthly episode becoming part of the greater story as our heroes battle their unseen enemies. The stories here depend more on the full team than the TV series, with its emphasis on Gwen's character, does and while some episodes feel that they could be made on a television budget others are deliberately more outlandish. The original publication in the then monthly magazine was A4 size but here the pages have been reduced to an American size for this softcover graphic novel. While it therefore sits comfortably with the modern American IDW Doctor Who reprint books, it feels out of place beside the British Panini Doctor Who Magazine reprints that you would have expected it to fit better with. In addition to this, while the creators of the strips are all credited at the front of the book there is no credit breakdown per episode. Since most episodes are preceded by an effectively blank page it would have taken little extra effort to credit the writers and artists at the beginning of each section that they worked on the in the same way that, for instance, Rebellion does in their Nikolai Dante reprint books. The credits are not as straight forward as you would expect, with Paul Grist illustrating six of the ten parts while only writing four, Simon Furman providing the scripts for the others, while one of Ian Edgington's three stories is with SL Gallant rather than long time collaborator D'Israeli who does the other two. Wikipedia provides a better credit source than Titan do for the reprints in this book. No doubt the photographic cover will have more people in shops picking the book up to browse through it than a comics cover would have, while the changing of artists throughout the book may prove to be a drawback for the non-comics fans. SL Gallant's art would be the most accessible while Paul Grist's and D'Israeli's more extreme styles may prove to be a turn off to the non-comics reader, yet for the comics reader the opposite will probably be true. Indeed the story is at is best when Paul Grist is both writing and illustrating and this book really should be considered a must-buy for Grist fans. Overall, the book makes a welcome addition to the comics Whoniverse particularly for those who are not quite interested enough to pay the monthly magazine's cover price just for the comic strip.